So far, we’ve only worked with lines 1cm apart. Why is that? I’ll tell you why – it’s because I’ve always suggested that’s the size we work at - no other reason! But it doesn’t have to be like that. Have a try at ruling your lines 15mm apart and write some words. Now try 20mm. Now 25mm. It gets harder the bigger the letters get, but in fact there’s no limit to how big you could go. Now let’s try getting smaller. How about 7mm apart. Or 5 mm. Or 3mm? All possible – It might be your eyesight that becomes the issue if we go any smaller! Most excitingly, there’s no reason why you shouldn’t mix sizes in one piece. How about addressing an envelope where the name is written large but the address is smaller? 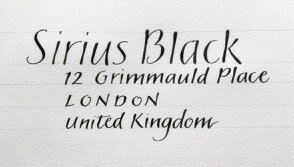 The free style of this lettering lends itself to writing on lines that weren’t ruled with a ruler. You can either draw a pair of lines to put the letters between, or for really free lettering, just draw one line and write on it. Don’t like a letter? Create a different one. Want some flourishing? Add some. Fancy joining your letters together? Do it. Seen some lettering you like? Recreate it for yourself. Your final mission is to create a piece using your new lettering skills – could be anything you’d like – and send it in for admiring!